If Tom Wolfe says he wants to come to Sydney to research a new novel, watch out. Apart from anything else, his recent novel Back to Blood, is a withering and unrelenting (if fictional) disclosure of the throbbing heart and sweating soul of Miami. The Miami Herald ran a story 'Tom Wolfe tells us how crazy we are' and considering The Miami Herald features in the book in a complex but not particularly flattering way, I think they are being magnanimous. I'm not sure the Sydney Morning Herald would be as relaxed. In any case, I believe Wolfe's fourth novel is a success and once you acclimatise to his trademark stream-of-consciousness (I wish I was as conscious of my thought processes as some of his characters are) you will discover this is one of the better books you will read. Wolfe scythes through the complex and tribal race relations of Miami - white 'Americanos', black Americans, Cubans, Haitians, Russians and more - using three dimensional characters who are not perfect but, as in real life, are not all bad either. Wolfe manages to wind through the novel, not only a detailed and honest account of the interplay of races and a fascinating love story but keeps the pace moving with Russian crime lords, international art frenzies and the sickly face of pornographic addiction and the role of pop-culture psychiatry. 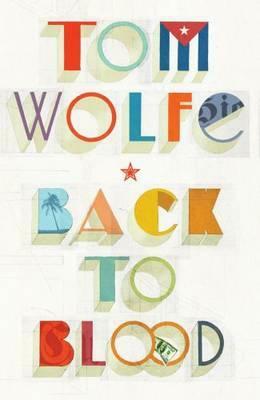 Yes, that's a lot of territory to cover but then it's a big book packed with strong, powerful characters so that Wolfe rarely seems to be 'telling', but showing, through their muddled and all too chaotic lives. Like ours. And the title, Back to Blood, is a revelation for one of the characters - with so much loss of meaning and reconfiguring and social upheaval, in the long run we all go 'back to blood', back to our racial groups, back to our 'people'.